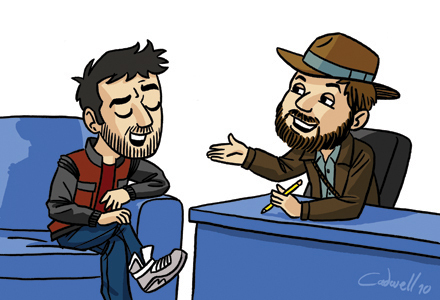 The Casting Couch – Poor Wee Me (right click and “save as” for download). Holler! We’re sure you’re missing us right now, but fear not! Here’s a treat for you all, another edition of the Casting Couch! Brother Wakeman recently sat down with Simon Powell, Paul Hurtsfield, Simon Dinnegan and Sean McKenzie to talk about the new British film Poor Wee Me and very entertaining it is too. That’s right Casta fans! It’s time for us to have a chin wag with real life film folk. This time Chris M had the good fortune to sit down with Rowan Joffe; writer and director of new film Brighton Rock starring Sam Riley, Andrea Riseborough, Helen Mirren, John Hurt and Andy Serkis – an adaptation of Graham Greene’s classic British novel retold in the sixties. This is Rowan’s big screen directorial debut but he has won critical acclaim with his previous directorial work for tv, as well as penning the script for last year’s brilliant George Clooneyfest The American. So sit back and enjoy fifteen or so minutes of exclusive to Casta action, featuring a very special appearance by a well known pop singer. This is the “special treat” we mentioned last episode but we just couldn’t wait another week to put it up, so expect more audio content in just less than two weeks and keep an eye out for more great written stuff, including another two this week! Thanks go to Laura at BAFTA and of course to Rowan himself for taking the time to talk to us. Brighton Rock is released this Friday so GO AND SEE IT! Welcome to another episode of The Casting Couch, Casta La Vista’s every-so-often journey into the world of film where we get to sit down with those in the know and have a wee chin-wag! This episode features an interview with Gareth Unwin, Head of Feature Film development at Bedlam Productions. Gareth has worked in film for over 15 years and last year produced the little seen UK gem Exam. This year Gareth has produced another feature, although this time the film comes with a little bit more buzz; his new film The King’s Speech is released on Friday Jan 7th and is already being tipped for awards glory this year. Casta La Vista sat down with Gareth as he and Bafta toured The King’s Speech around the UK last December to talk about how the film came together, dealing with hype, and what the future holds for Bedlam Productions. Thanks go to Bafta, Nottingham Broadway, Bedlam Productions and of course Gareth himself for the opportunity, we hope you enjoy the finished product! Look out for our next full episode of Casta La Vista coming very soon for the Chris’s thoughts on The Kings Speech. Welcome to Day 4 of the 12 Days of Castmas and another installment of the Casting Couch, Casta La Vista’s very own way of shoehorning ourselves into “the biz” where we take full advantage of the opportunities given to us to talk to people in the know about movies and such like. This Casting Couch features Matt Greehalgh (super screenwriter of Control and Nowhere Boy) and Nev Pierce (editor-at-large of Empire magazine) who sat down with Chris W for a nice chat about the UK media industry and beyond when they came to Derby last month as part of ID Fest. The conversation itself has been cut down to its best bits and Cee-dub has thrown a commentary in between sections so that they make a bit more sense. Apologies in advance for the noise of the travelling carnival booming from outside the interview room. Also big thanks to Adam Cadwell for the spiffing picture of us above – hopefully we’ll have need to use it on many occasions in the future. Yowza! Welcome to Casting Couch numero dos- a conversation with Gareth Edwards, writer/director of Monsters, a film that hasn’t even been released yet! Chris M saw Monsters at the Edinburgh International Film Festival all the way back in June and was raving about it even then. When we spotted that it was being screened in Nottingham with Gareth in attendance we tried our hand at seeing if he would sit down with us for a bit of a chin wag- and lo and behold he was bloody well up for it! 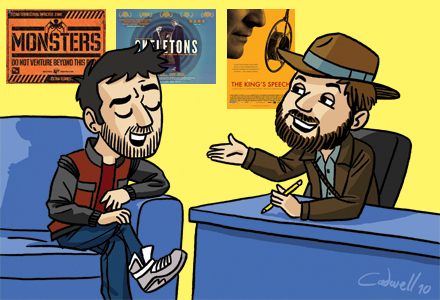 What follows is Chris M’s interview with Gareth whilst I was enjoying watching the film for the first time. You can read Chris M’s review of the film from the Edinburgh International Film Festival here and check out the film’s official website here. Monsters is released in the UK on December 3rd and please do make sure that you get to the cinema to see it; it is a genuine highlight of 2010 and well worth the price of admission. Thanks once again to Gareth for the interview and to Vertigo for helping us to set the whole thing up. Hello friends; as I’m sure you all know, Chris of the Wakeman is currently without internet, but that doesn’t mean no new audio Casta content for you, oh no! 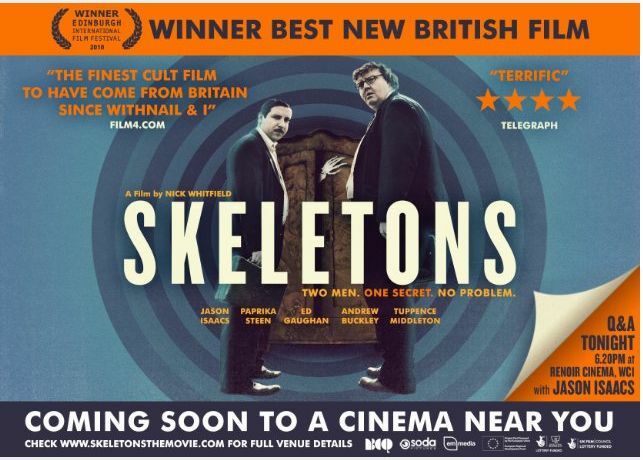 Chris recently had a sit down interview with Nick Whitfield, the director of British film Skeletons – which I reviewed at the EIFF here. Special thanks go out to Derby Quad who originally organised the interview and let us steal it appropriate it. Cheers guys! You are currently browsing the archives for the The Casting Couch category.